Get out and enjoy Minneapolis parks year round! Learn about our parkway maintenance. When does MPRB clear snow? Snowfall of two inches or more: We utilize all staff on a regular work shifts or with overtime hours as necessary. Snowfall of less than two inches: Staff clear snow within regular work shifts. Ice storms and other unusual weather events: Safety is the top priority as MPRB plans its response. Tier A locations are usually completed before Tier B. Tier A and B locations must be completed per City of Minneapolis ordinance before clearing Tier C (ice rink) locations. Staff may make two to four passes to fully clear paths, especially during extended or extreme snow events. They return as needed to clear blockages at intersections and parking lot entrances that result from snow-clearing on streets and adjacent properties. 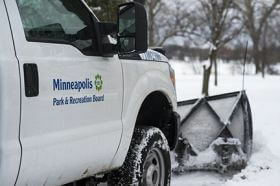 For snow-emergency parking rules and routes, visit the City of Minneapolis website.